The State Department has approved Finland’s request to buy F/A-18 aircraft equipment and related services from the U.S. government under a potential $156 million foreign military sales agreement. 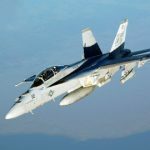 Finland asked to procure 90 Multifunctional Information Distribution System Joint Tactical Radio Systems, test and training equipment, spares, and repair parts in support of the country’s Mid-Life Upgrade Program that seeks to extend the life of its F/A-18 fighter jets, the Defense Security Cooperation Agency said Monday. Raytheon (NYSE: RTN), Lockheed Martin (NYSE: LMT), Boeing (NYSE: BA), BAE Systems’ U.S. arm, General Electric, General Dynamics (NYSE: GD), Northrop Grumman (NYSE: NOC), Rockwell Collins (NYSE: COL), ViaSat (Nasdaq: VSAT) and Data Link Solutions will act as principal contractors for the FMS transaction. The deal also aims to increase the aircraft’s communication connectivity and covers software test and integration center updates, transportation, technical documentation, staff training, flight tests, logistics support and technical services. DSCA said it notified Congress of the potential sale Friday.